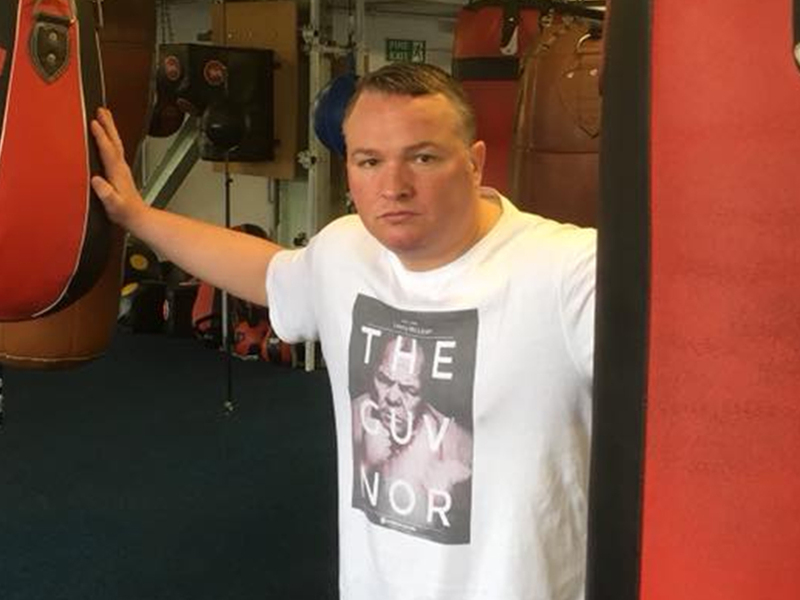 Bradley Welsh -- a co-star in 'Trainspotting 2' -- is dead after he was shot in the head on the streets of Scotland's capital city ... this according to multiple reports. 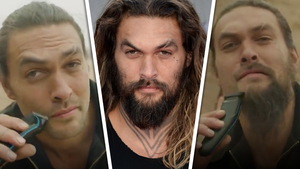 The actor was reportedly gunned down Wednesday night on the streets of an affluent neighborhood in Edinburgh ... and he died at the scene. Scottish police swarmed the area to investigate the shooting ... putting the neighborhood on lockdown. Bradley biggest film success came playing a gangland boss in the "Trainspotting" sequel. His character owned a couple of seedy saunas around Edinburgh. 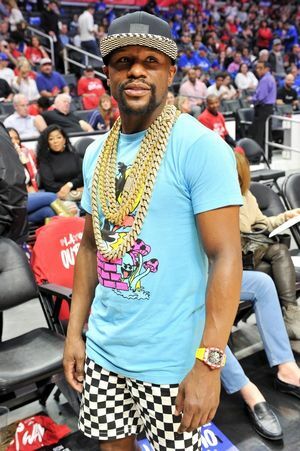 Welsh is also a former British ABA Lightweight boxing champion. 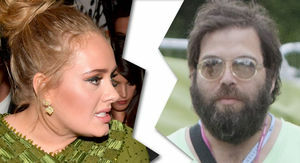 Back in 2009, he was featured on the Bravo docuseries, "Danny Dyer's Deadliest Men." Bradley wasn't even an actor before catching his big break on 'Trainspotting 2' ... and he reportedly ran into trouble with the law as a soccer hooligan. 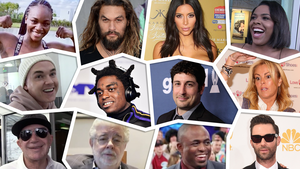 Welsh was a positive force in his community in recent years ... reportedly running a boxing gym and staying involved with charity projects aimed at helping youth stay out of trouble. 5:40 PM PT -- The procession is finally approaching Marathon Clothing -- at the intersection of Slauson and Crenshaw -- and the crowd is THICK. Thousands of fans are lining the streets leading up to the store ... where even more people have gathered. Several Nation of Islam security guards are surrounding the hearse as it slowly rolls through the crowds. The Eritrean flag is draped on the roof, repping for Nip's heritage -- his father emigrated from the east African nation. 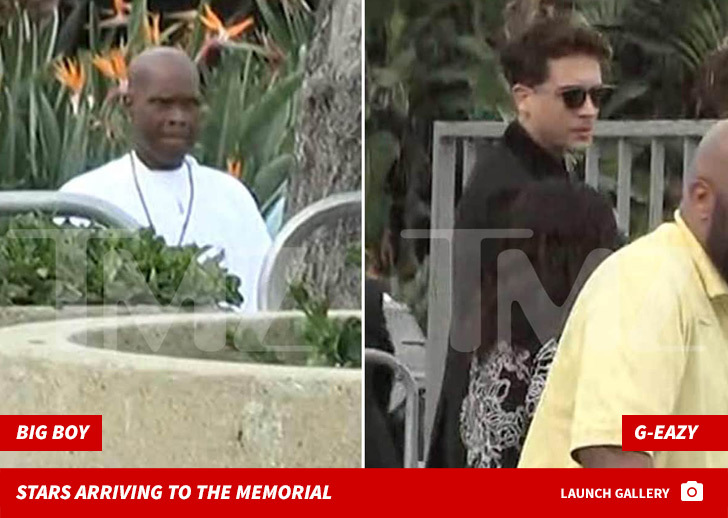 2:10 PM PT -- The memorial just wrapped after some rousing tributes from Snoop Dogg and YG ... followed by Stevie Wonder -- who performed "Rocket Love" and "Tears in Heaven." The funeral procession is about to begin ... with the route looping through South L.A., and ending at the Angelus Funeral Home. 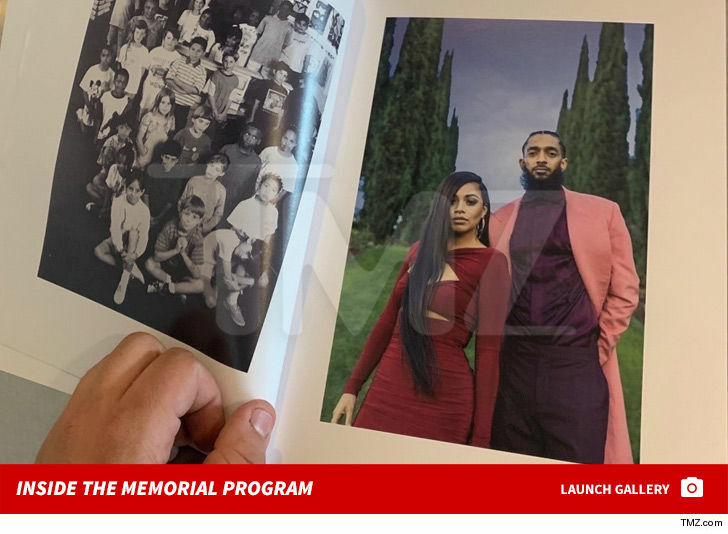 12:45 PM PT -- Lauren started her tribute to Nipsey by reading a text message she sent to him back in January, while she watched him sleep. In part, she said, "I want you to know I feel real joy in my heart when I'm around you. I feel safe around you. Protected. Like a shield over me when you're around." 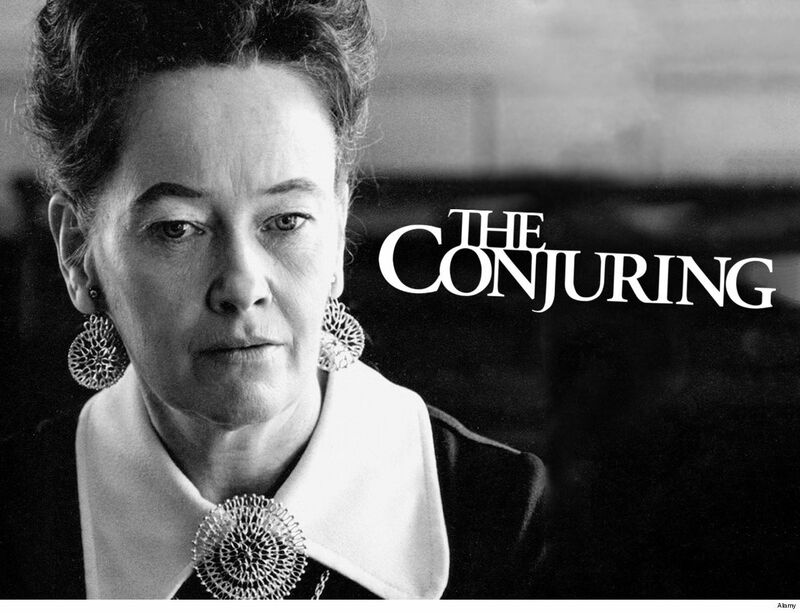 She ended the text with ... "My truth is this. I'm never going to give up on you. My love and devotion is to you." 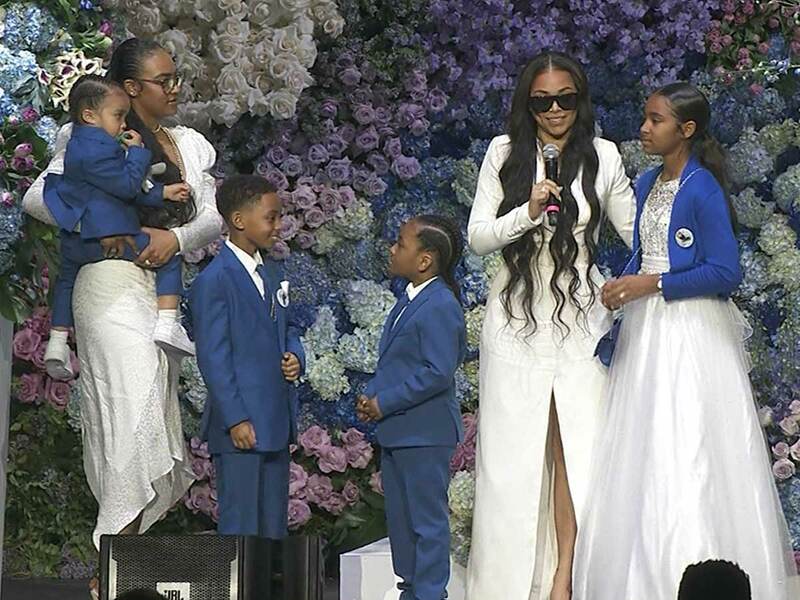 Lauren also talked about how Nipsey cared for his children and made sure his family left home each day with the right energy. She said, "My pain is for my 2-year-old who probably won't remember how much his dad loved him." She shared something Nipsey always said to her ... "You can't possess people, that you experience them. I'm so honored and blessed that I got to experience him." Then she closed her tribute with an incredibly moving message for all of Los Angeles you MUST see -- and a personal note to her love ... "Until we meet again ... the Marathon continues!" 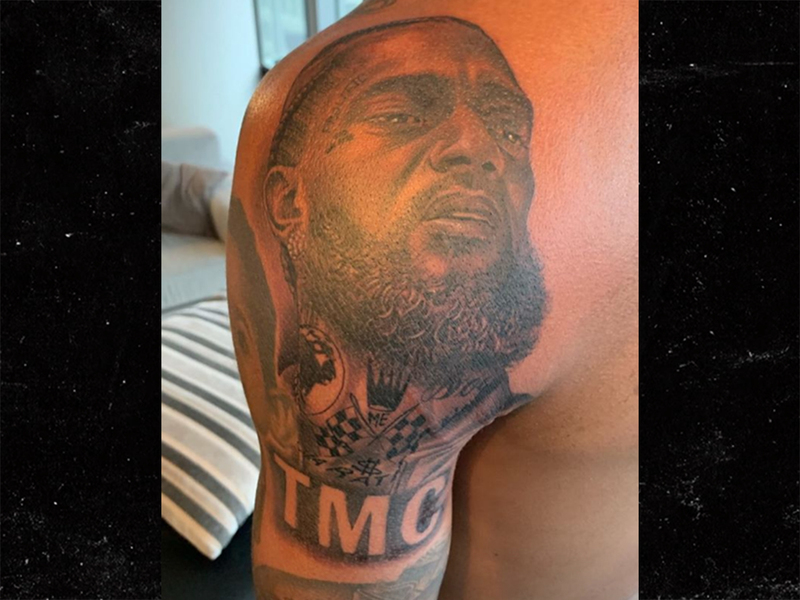 Minutes after the funeral ended, Lauren showed off her new tattoo -- a tribute to Nip, with a caption, "Real Love Never Dies." 12:35 PM PT -- Nipsey's mom and dad just got onstage ... where his mom shared one of the final text message exchanges she had with her son. She also spoke of what a great man he was and how he was such a light in his community. 11:54 AM -- Lauren was onstage just moments ago with her and Nipsey's kids. Lauren's son, Kameron, shared a dream he had about Nipsey rising out of the ocean before leading the crowd to chant "respect." 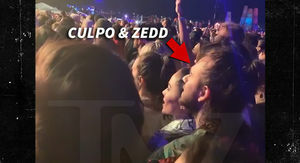 The family then gave way for Jhene Aiko to come onstage and sing. 11:07 AM PT -- The Celebration is now underway. 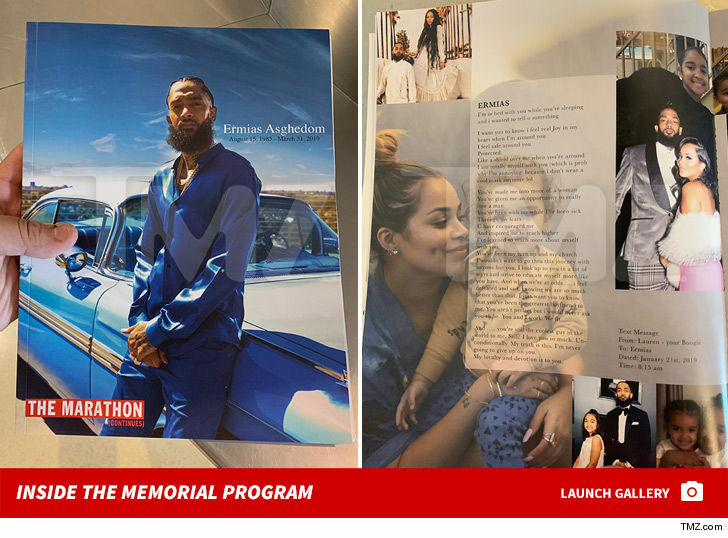 Nipsey Hussle's Celebration of Life is about to begin at Staples Center, and TMZ is live streaming what's expected to be a very emotional memorial service. 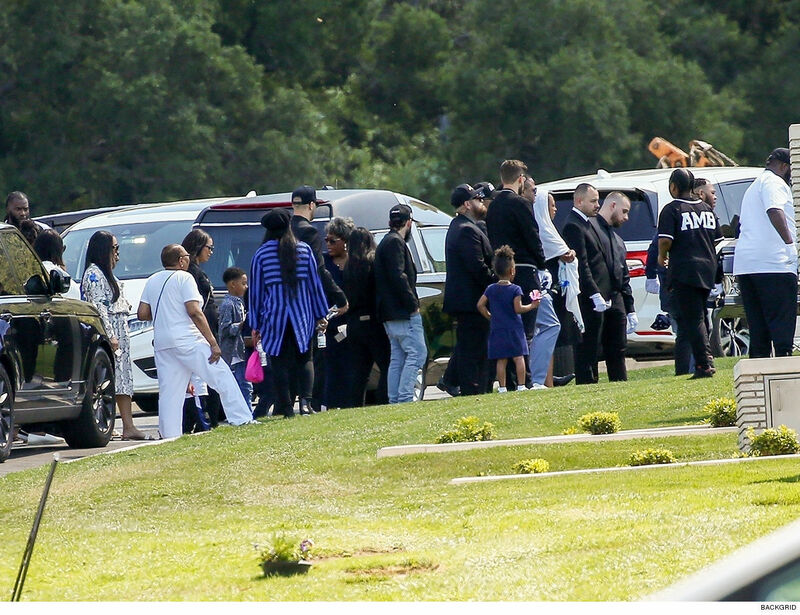 The silver hearse carrying Nipsey's body arrived outside the arena early Thursday ahead of the ceremony. 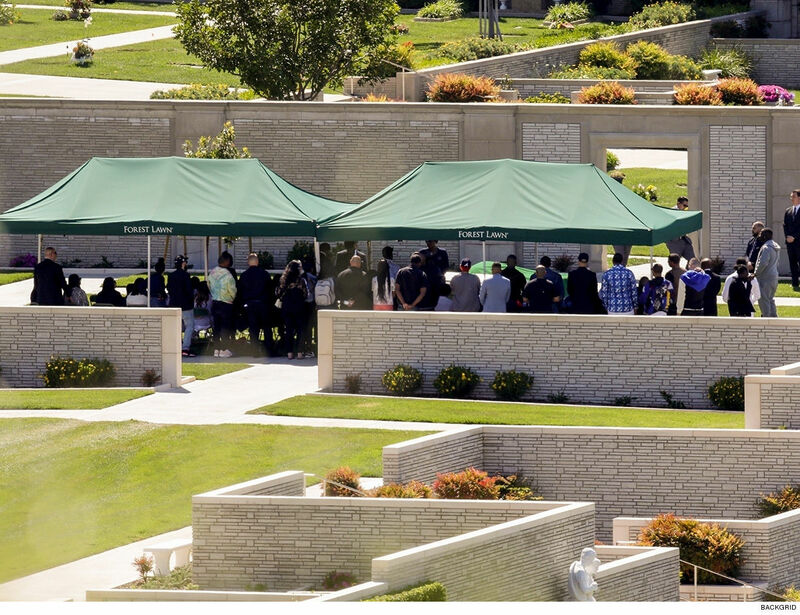 As you know, the free tickets to his memorial were hard to come by this week, as they were gobbled up within minutes after they were made available to Cali residents. It's also a heavily guarded affair, with a mix of muscle from LAPD and Nation of Islam, as well as Staples Center personnel. The memorial program is full of notes of goodbye and memories from close friends and family. 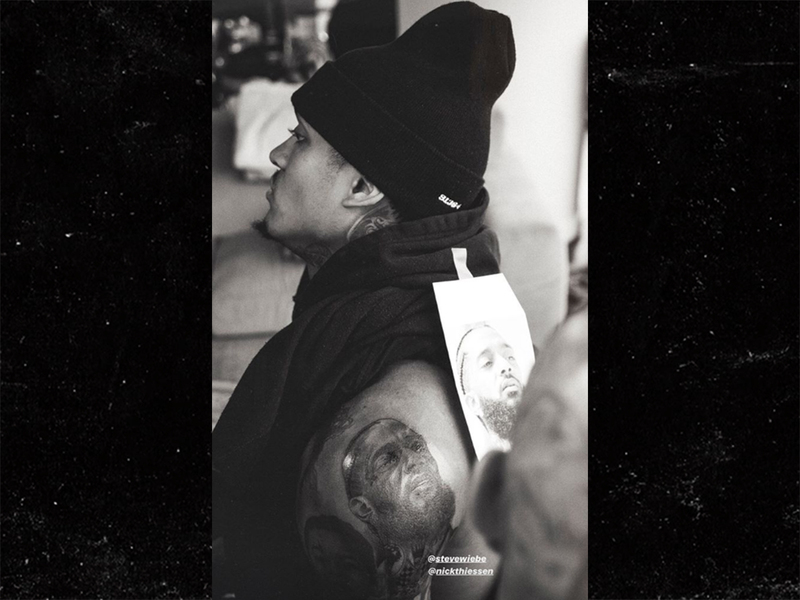 Lauren London shared a touching text she sent to Ermias -- Nipsey's real name -- before his death. 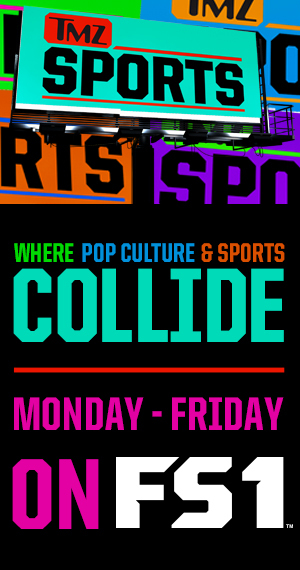 There are also letters written by James Harden, DJ Khaled, Kendrick Lamar, LeBron James, The Game, and tons of others. 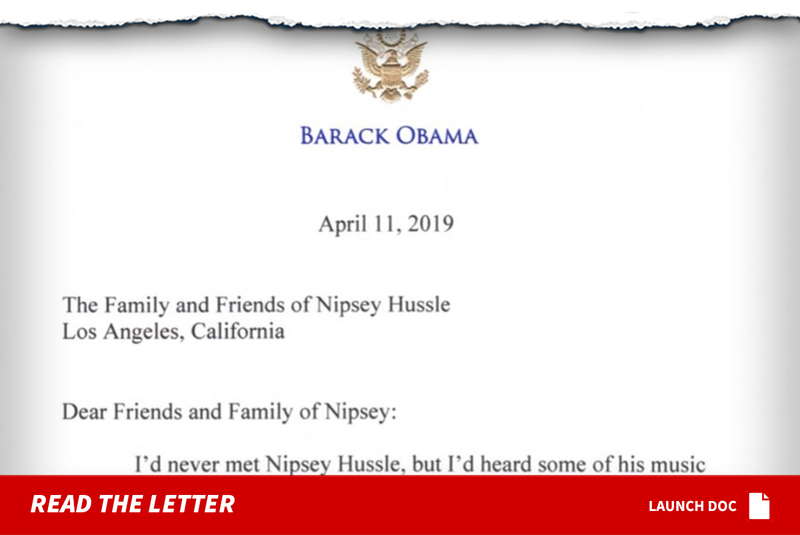 The ceremony opened with a surprise ... a reading of a letter sent to Nipsey's family by President Barack Obama. 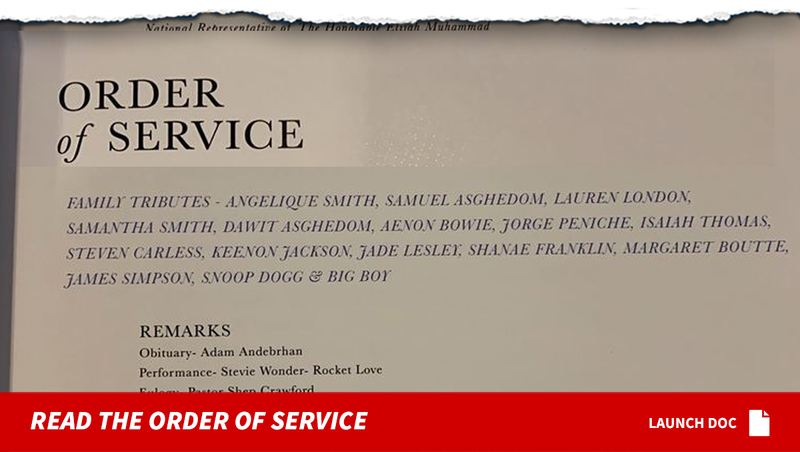 We also got the Order of Service and it confirms many of Nipsey's celeb friends will be heavily involved ... including Anthony Hamilton, Marsha Ambrosius, Snoop Dogg, Jhene Aiko, YG, Stevie Wonder and Big Boy. Minister Louis Farrakhan will also speak during the ceremony. 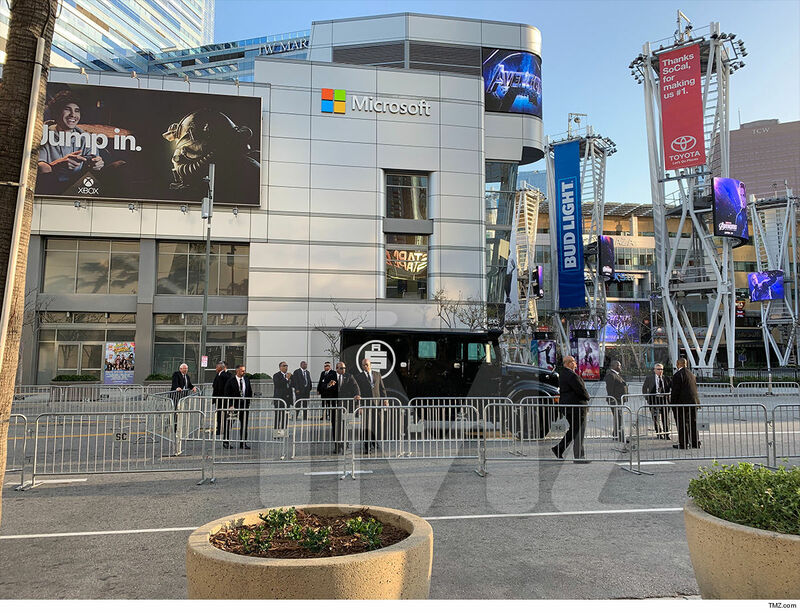 Nipsey's armored truck with his All Money In record label logo is parked outside Staples and, as you can see, it's heavily guarded. 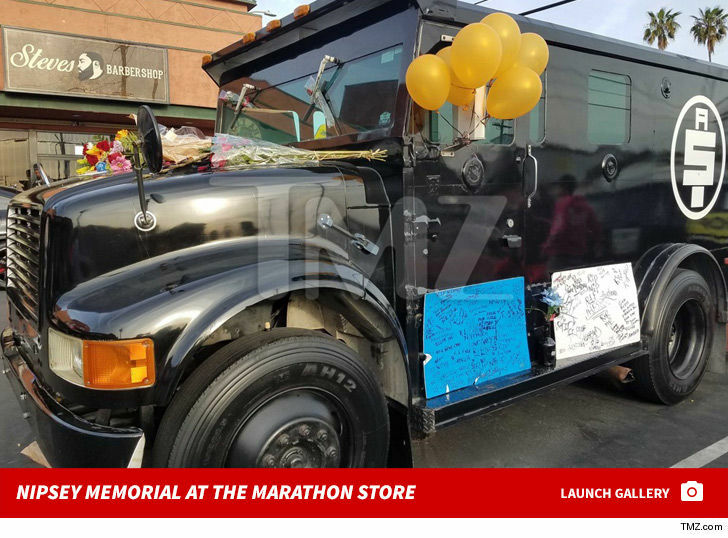 The truck is normally a fixture outside his Marathon Clothing store. 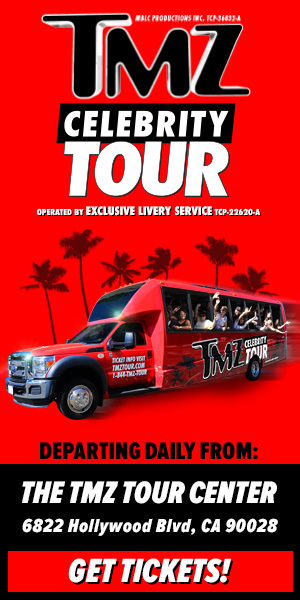 The service starts at 10 AM sharp and runs through noon. 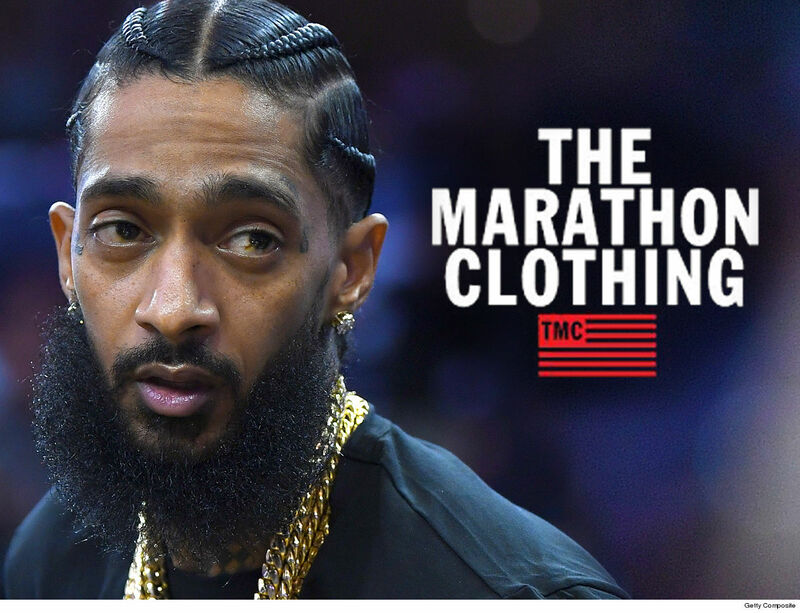 Afterwards, a funeral procession will carry Nipsey's casket on a 25-mile trek through much of the city, stopping at important landmarks like his store, and ending at a funeral home. 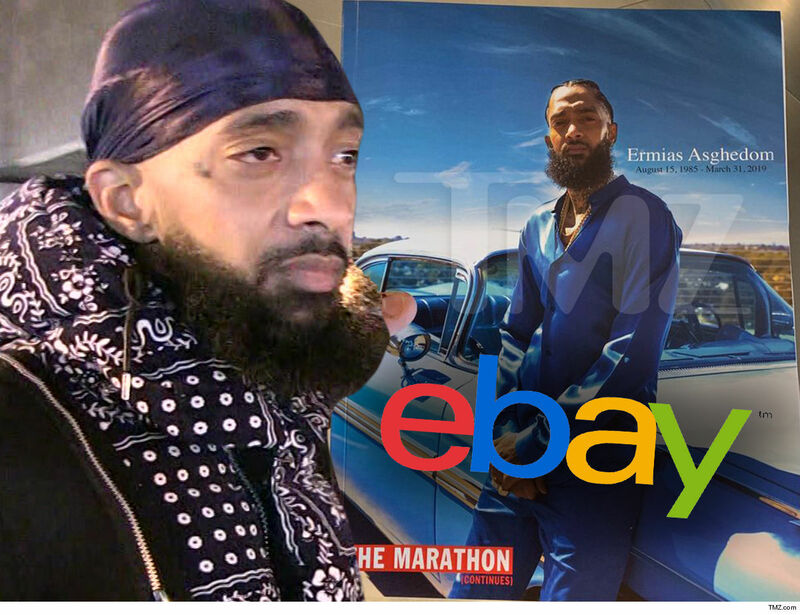 We'll be live streaming the procession as well ... throngs of fans and supporters will be flooding the streets, as Nipsey makes one final victory lap through the neighborhoods and communities he fiercely supported. 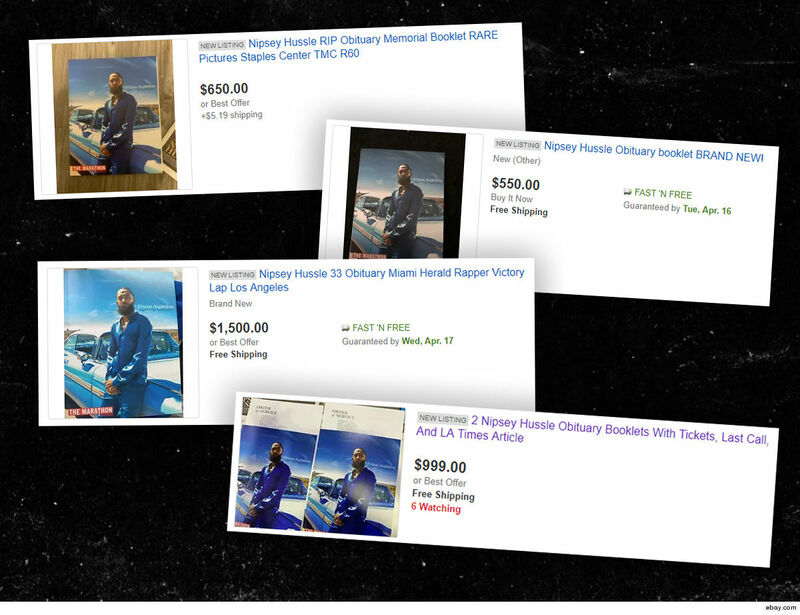 Nipsey's shocking death is prompting extraordinary developments in L.A. -- a full peace treaty between several gangs, who are putting down firearms and showing more unity to honor Nip. 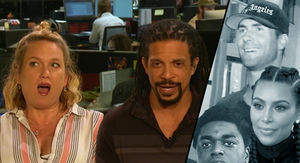 Gang leaders from Watts, Compton, L.A. and Inglewood already marched for peace. 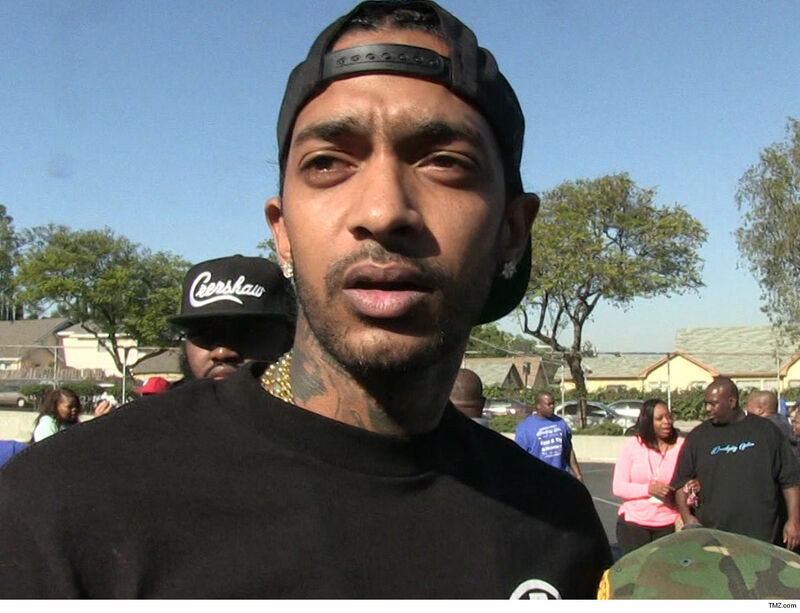 As we first told you ... Nipsey was gunned down March 31 outside his store in the Hyde Park area of L.A.. He died from gunshot wounds to the head and torso and was pronounced dead 35 minutes after being shot. 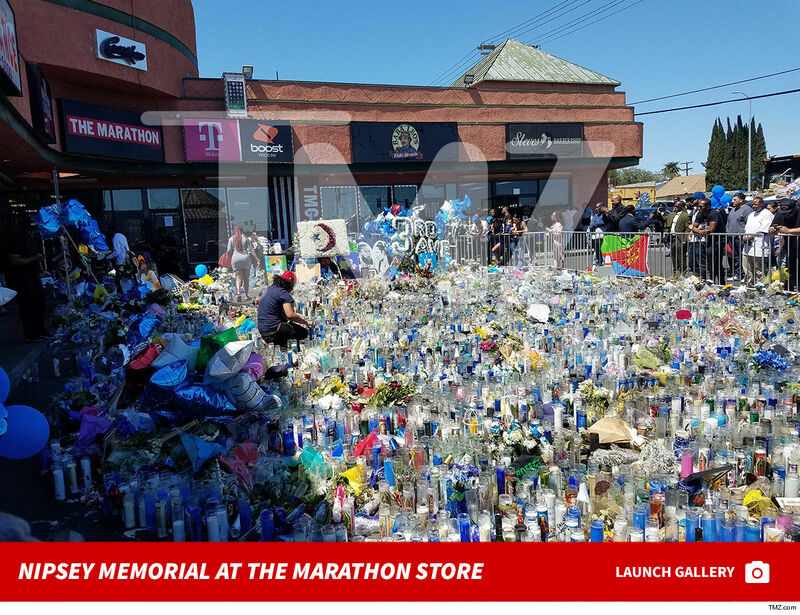 In addition to this morning's celebration of life ... fans have been leaving messages, candles and flowers in the parking lot outside Nipsey's store, and his family and friends mourned him Wednesday afternoon during a private viewing. 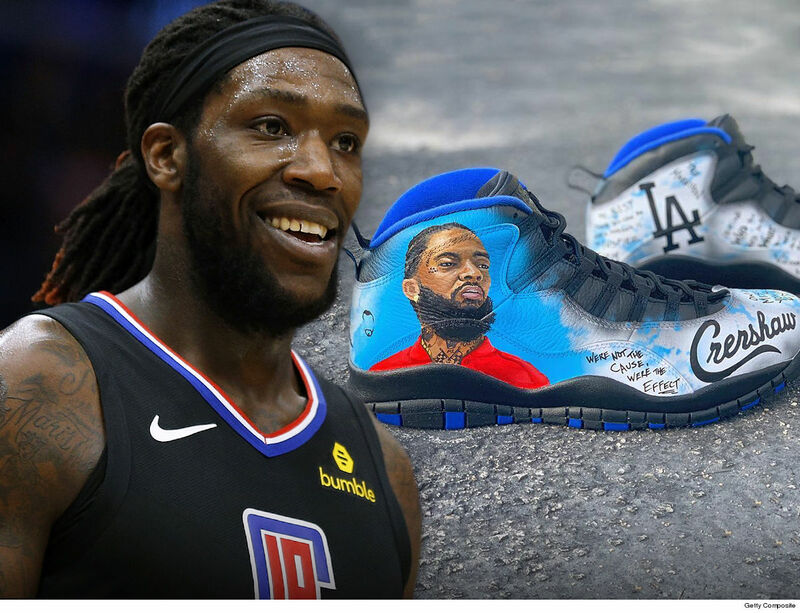 Montrezl Harrell will be reppin' the late Nipsey Hussle when the L.A. Clippers take the court in the NBA playoffs ... honoring the L.A. artist with a pair of one-of-a-kind kicks!!! 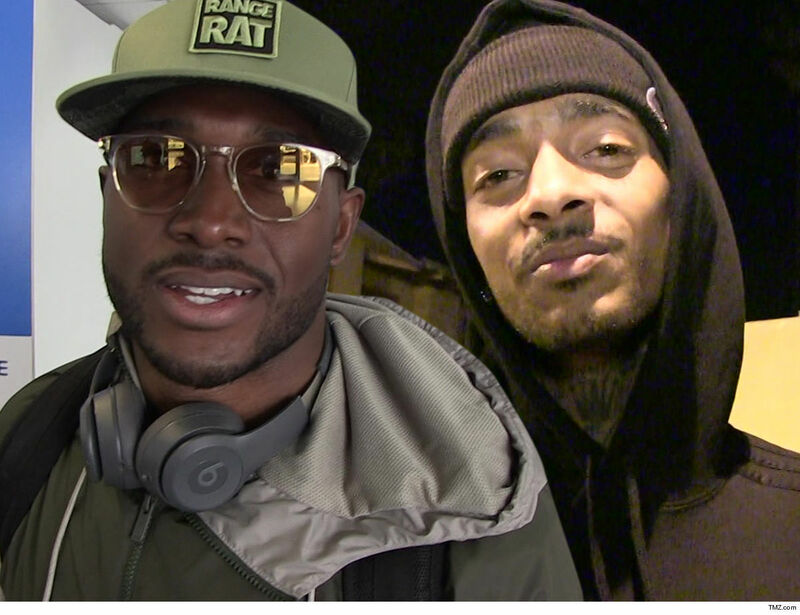 TMZ Sports has learned ... Trezz wanted to pay homage to Hussle in the Clips' first playoff game this weekend ... so he hit up Marcus Rivero AKA Soles By Sir to whip up the special Js. 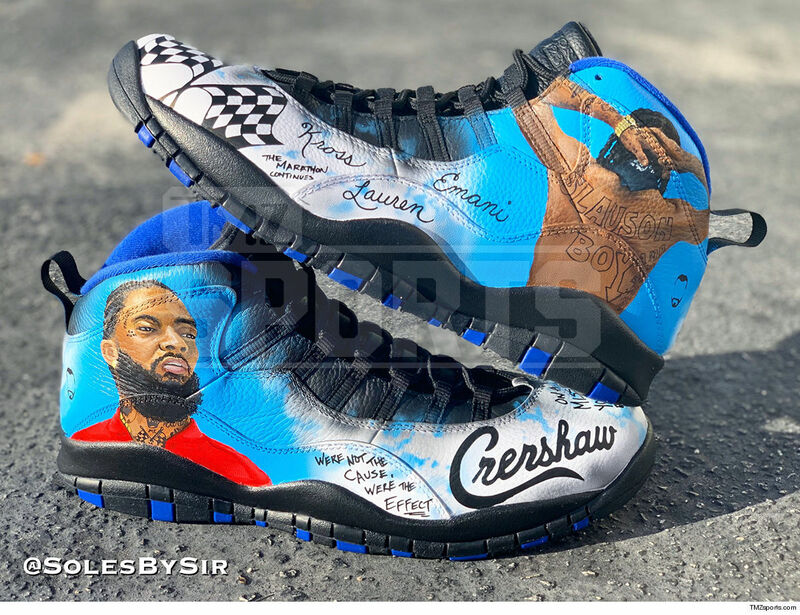 Rivero tells us the shoes are extra special ... and feature the names of people close to Nipsey -- his longtime GF Lauren London, his children ... as well as lyrics from some of Hussle's songs. Trezz has been honoring Hussle since his tragic death late last month ... and even wore a custom Clippers jersey with Nipsey's name on the back. Of course, other NBA stars like LeBron James and Russell Westbrook -- who dedicated his 20-20-20 game -- have honored Hussle. We're told Trezz will wear them when L.A. takes on the Warriors.